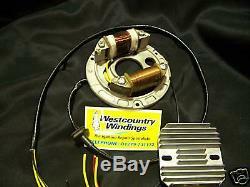 This is a 12 volt conversion of your own stator by us at Westcountry Windings suitable for trail bikes running 6v AC lighting. Bikes include, Yamaha XT & DT, Suzuki SP & TS, Honda XL & XR, Kawasaki KE & KL and many more. 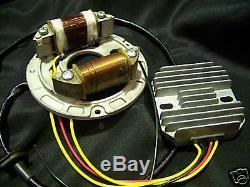 A suitable 12v Regulator/Rectifier is supplied with the rewind. 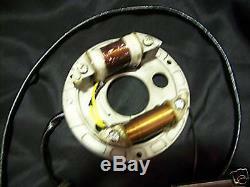 The conversion requires a small amount of re-wiring to connect the lighting circuit to the battery. The item "12 volt Lighting Conversion Suzuki SP370 DT TS XL XT KL Includes reg rec" is in sale since Friday, January 11, 2019. 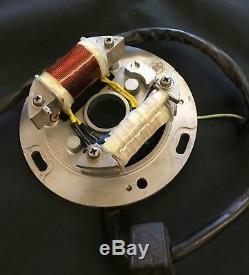 This item is in the category "Vehicle Parts & Accessories\Motorcycle Parts\Other Motorcycle Parts".windings" and is located in Matching Green Nr Harlow, Essex.